Dried biological samples should be stored in standardized paper bags (envelopes, brown paper bags) in a dry and cool environment. This will preserve the DNA over months to years. If dry samples need to be stored for more than 2 years, freezing below — 20°C is recommended. To avoid paper layers sticking to each other in the freezer, the envelopes should be put into plastic bags. Never write on plastic surfaces that become frozen because any type of ink will easily come off. Use paper labels instead. In temperate parts of the world, DNA was successfully extracted out of clothing and smears on slides that had been stored more than 10 years in dark environments at room temperature. In tropical countries, freezing is always necessary because of the high humidity, which allows bacteria and mold to build up. Biological stains on glass slides, either embedded (histological tissue samples) or just regular smears (vaginal smears or blood), generally lead to good extraction results. The slides should be stored in standard cases for microscopic slides. Alternatively, they can be fixed with sticky tape inside of a paper envelope. Traces of dust generally do not affect the quality of dry stains but should obviously be avoided. Insects collected at crime scenes or from corpses should not be dried because museum beetles will frequently destroy the samples within months. The insects should be preserved in 90% EtOH. At room temperature, DNA extraction of such material will then be possible up to several weeks after storage; at temperatures below — 20°C, extraction will be successful for several years. [10-12] Never use formalin to preserve samples; it will degrade the DNA. Depending on the applied extraction method, DNA stored in TE [10 mM Tris-HCl (pH 7.5), 1 mM EDTA] or similar buffers may be stable for weeks (after Chelex extraction) or months (phenol/chloroform extraction or use of spin columns) in the refrigerator at +4°C to + 12°C. Freezing of extracted DNA in TE buffer below — 20°C will preserve the sample for years. Before freezing, it is strongly recommended to distribute the DNA in small aliquots (e.g., 10 pL each) to avoid repetitive thawing and freezing of single samples. 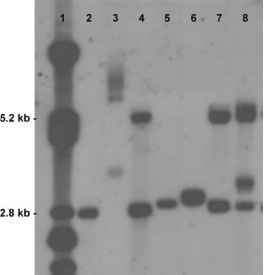 The standard storage buffer for extracted DNA is TE buffer. Before its use, the buffer is autoclaved or cleaned with a sterile filter. It can then be stored at room temperature. Under extreme conditions in the field, if drying of the samples is impossible (because of dust, humidity, chaotic mass disaster environments), TE can be used to collect samples by aliquoting 1 mL TE into sterile 1.5-mL plastic tubes. The collected biological stains can be put inside these emergency containers. DNA must still be extracted as soon as possible, and the samples should be stored as cool as the situation allows. If more than a few hours are expected to pass before freezing or drying is possible, any solid biological sample in the field should be stored in centrifuge tubes containing aliquots of 95% EtOH. At room temperature, this will preserve the sample's DNA for weeks.